The traditional Vietnamese art of silk painting has become famous around the world for its simple poetic themes and vibrant colors. The success of a silk painting very much depends on the quality of the silk, and this depends on many factors, from the quality of cocoons to the decisive techniques of starching and weaving. Differently with other kinds of paintings, the silk canvas are usually not painted. 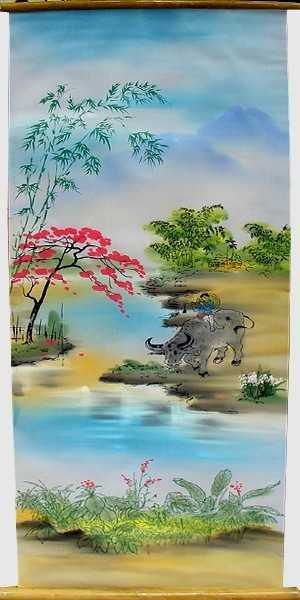 The Vietnamese traditional silk painting style tends to use the silk canvas directly as the background of the painting. The colors are used delicately with the canvas to make Vietnamese silk paintings. The delicate white color found in the sky, water, or human portrait, is the color of silk. The color of silk is well known to describe human figure in the paintings of many famous vietnamese artists. Delicate color and silk background give the paintings such an harmony with the nature. Whatever style they follow, silk painters must have an intimate knowledge of the material and fully exploit its shininess and its attractiveness. Painting silk is full of changing and unexpected characteristics, and a wrong stroke of the brush is irreversible. These paintings are made by the Vietnamese artists in Hue, central of Vietnam (110km from North of Da Nang.) These paintings are about the beauty of Hue, the most splendid royal capital of Vietnam, and of other famous provinces of Vietnam. This is an interesting collection that reflects the beauty of Vietnam via various landscapes and vietnamese daily activities. The bamboo scroll silk paintings are made in the north of Vietnam. The oriental bamboo scrolls are perfect frames for the paintings. Each painting is a great description of the beautiful nature and talented skills of the Vietnamese.